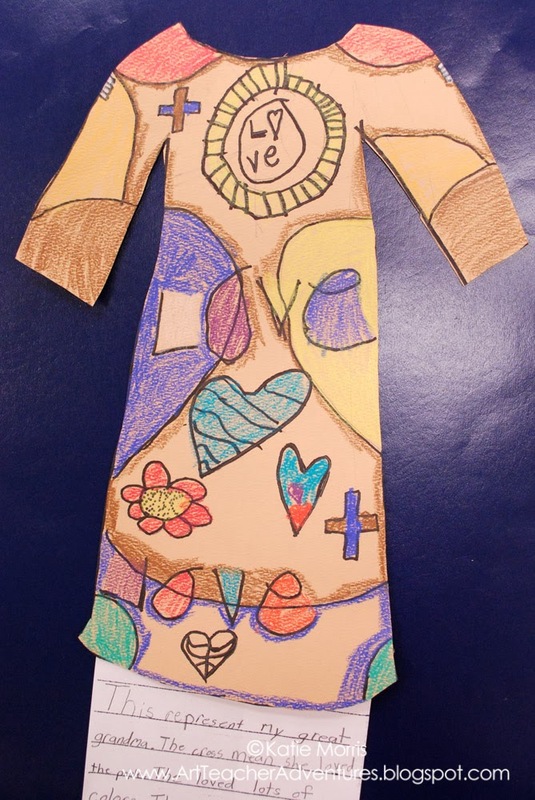 For our Cultural Heritage study on Native Americans, 3rd grade students explored the Plains Indians’ idea of adorning special clothing with symbols to honor or represent someone. 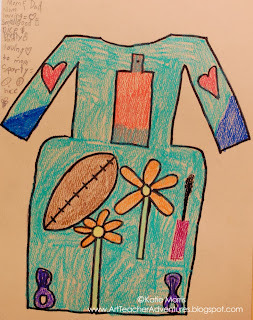 After learning about symbolism on shirts and dresses, the students designed a shirt or dress to either honor someone special to them or represent the artist. To begin the studio portion of the lesson, the students chose a specific person and brainstormed possible symbols to represent them. I asked the students to list good qualities of the person on the back of their paper because I wanted them to really work on the symbols, not just drawing things that "look indian". 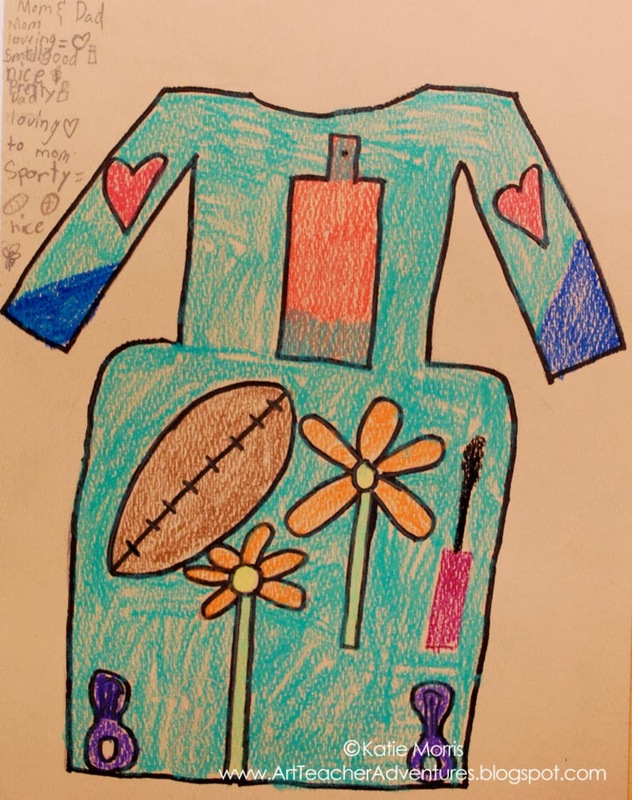 After developing a list of symbols, the students drew the outline of a shirt or dress on their 11x14 inch paper. We spent some time talking about composition and how on the shirts and dresses we saw, the symbols made a really nice overall design- there was thought behind the placement instead of just floating pictures. 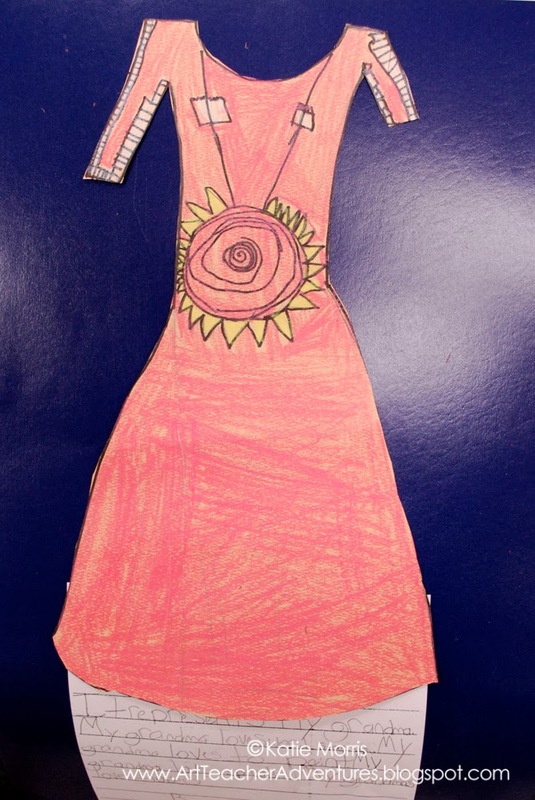 The students laid their designs out in pencil, traced with sharpie, and added color with regular and construction paper crayons. 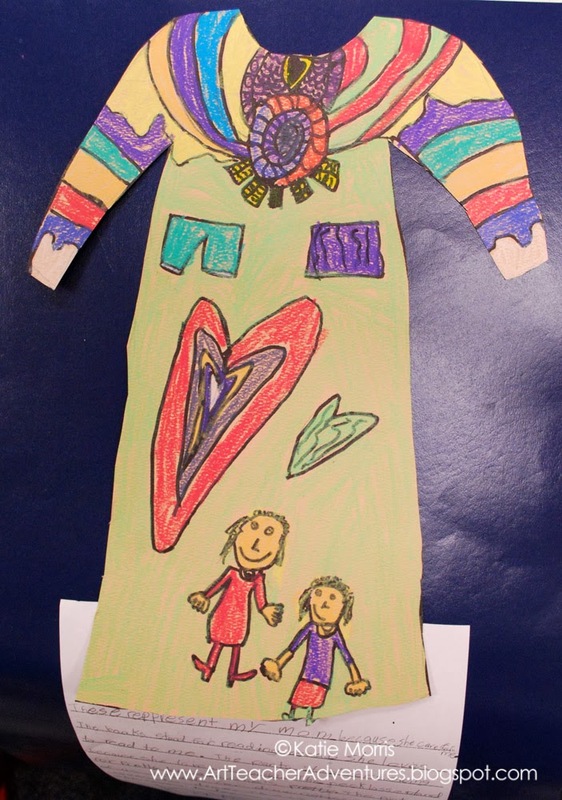 When the students finished adding color to their artwork, they cut out the "garment" and wrote a description explaining how the design represents the person they chose to honor. My Friday classes didn't have as much time as the Monday/Tuesday classes, so to save time, they worked on smaller paper, didn't cut out their garments, and wrote out a symbol "key" on the front instead of attaching a separate piece of paper. 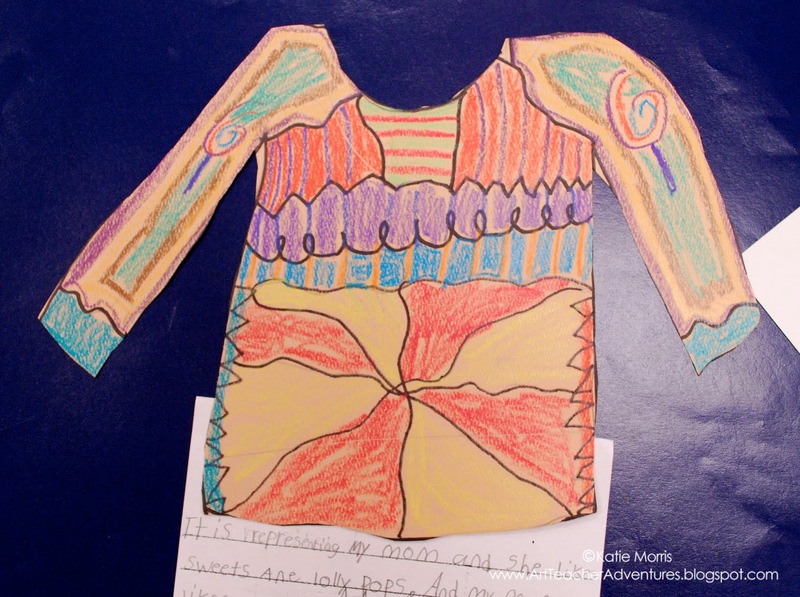 *The initial inspiration for this lesson came from a National Museum of the American Indian resource. It was available on their website (www.NMAI.si.edu) under explore, for educators and students but the link doesn't seem to be working today. The Give Away Horses dress was created by beaders in the Growing Thunder family. Each design element is a symbol that helps tell the story of how Joyce’s grandparents would have a ceremony to give away horses in honor of their grandchildren. The women sewed beads on the dress for 16 hours a day to complete the piece for an exhibit at the National Museum of the American Indian. 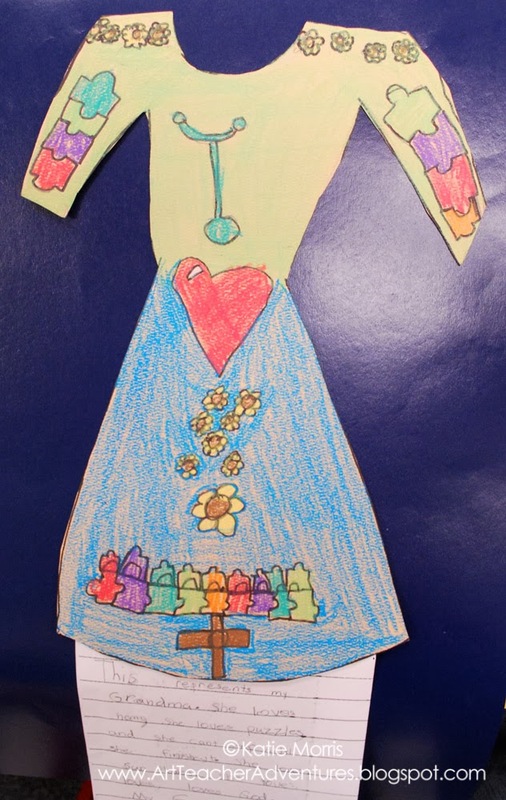 Traditional dresses worn for special occasions may be decorated with symbols that honor family members and connect the wearer to her family and community. In addition to the images from NMAI, I found some cool pictures in a FiberArts magazine review. The article said that some warriors wore shirts that “were decorated with personal images and designs that symbolized the deeds and valor of their wearers". (FiberArts Magazine, Beauty, Honor, and Tradition: The Legacy of Plains Indian Shirts). 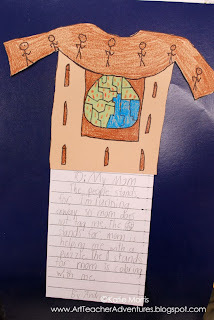 I loved your idea on Native American. I am na English teacher in Brazil, South América and thanks you a lot.